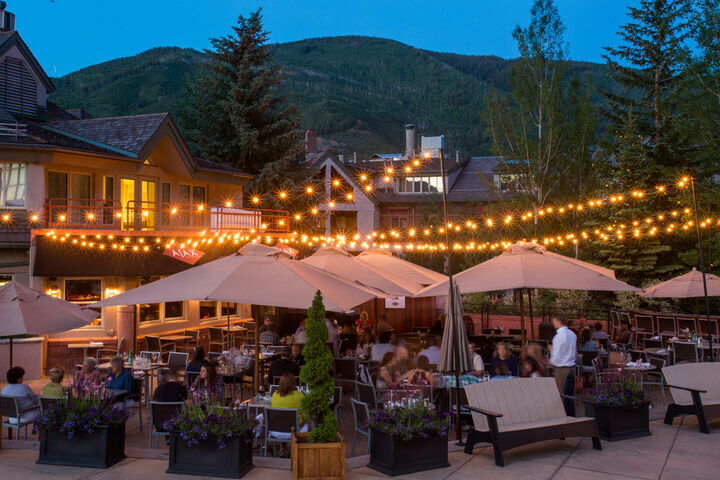 The best patios in Aspen all share something in common: They perfectly blend food, drink, and atmosphere to create a memorable, panoramic experience. Whether your ideal patio setting is an intimate, low-lit affair or a rowdy afternoon in the sun, Aspen has a unique mix of restaurants with patios. Our favorites are outlined below. Nowhere is as lounge-worthy as Ajax Tavern’s sun-drenched, mountainside patio. From a bird’s-eye view, the patio stands out from halfway up the mountain. 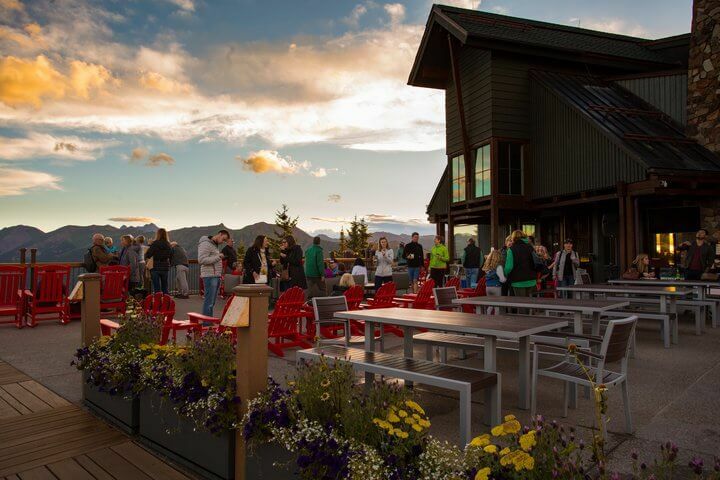 Given it’s adjacent to the Silver Queen Gondola, this patio is an easy-in, easy-out choice and offers great opportunities to wave down old and new friends. Bites and buzz: Dressed with grana padano and parsley, dip the Ajax truffle fries into sauce or eat them as they are: totally delectable. Follow the fries with a Rich Spritz 18, which blends Veuve Clicquot Rich champagne, Cointreau, seasonal citrus, lemon, and lime juice. Standing strong at 11,212 feet, the Sundeck on Aspen Mountain is a crowned jewel. Here, you can sit that much closer to the sky’s eye and breath the highest mountain air that a patio can offer. After lunch or a snack, stroll through the wildflowers or start your morning with a hike. Bites and buzz: Do not miss the made-to-order stir-fry. 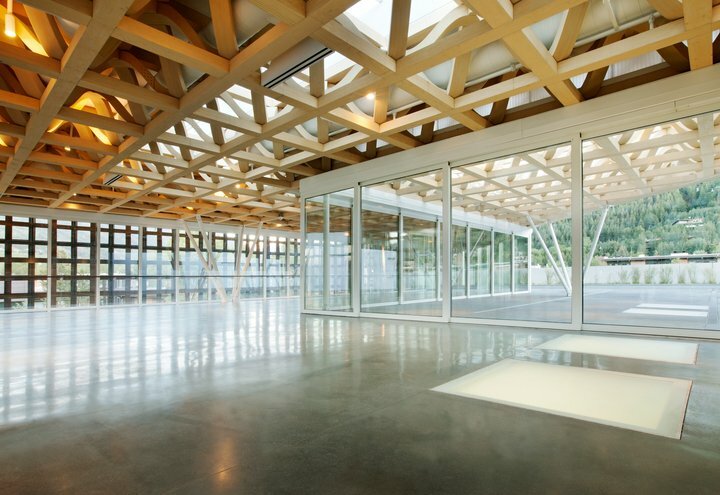 Wrap your mind around the newest exhibits at the Aspen Art Museum and complement brainwaves with a nutritious plate from SO and vitamin D on the rooftop patio. Casual and expansive, head up in the morning to get the patio to yourself. Bites and buzz: You can’t go wrong with the featured salad, which rotates weekly, paired with a bubbly Pellegrino. Ales, sours, browns: Every shade of beer captures the glow of the sun from Aspen Brewing Company’s glorious patio. Set back from Aspen’s mountainside, the eyes can rest on town’s street activity and a vibrant green backdrop of pine and aspen trees. Bites and buzz: Sip the Silver City ale, the brewery’s kettle-soured session ale. Colorado’s sunshine is incredible—but shade can be so very appreciated. Sound like a good recipe for the day? 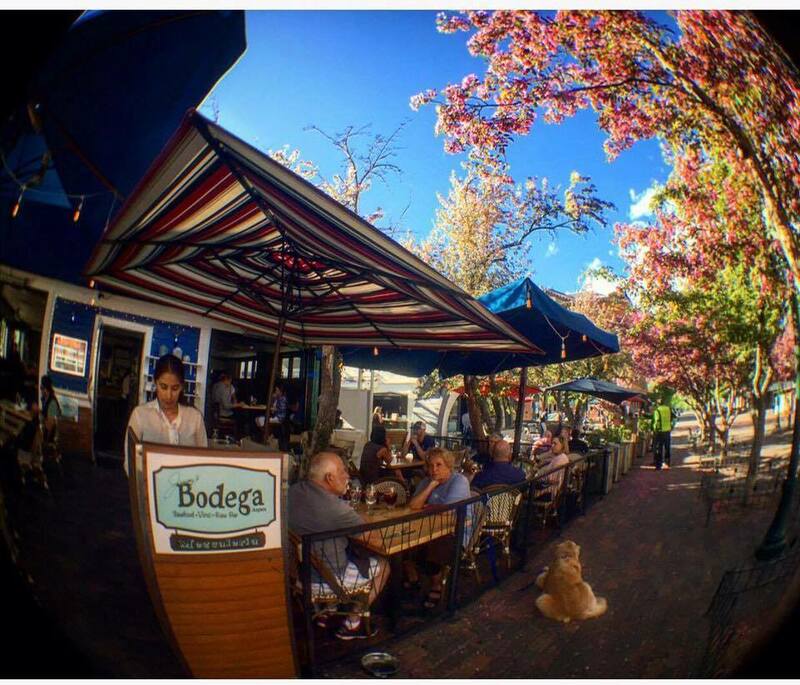 Grab a table beneath the umbrellas at Jimmy’s Bodega. In the midst of downtown Aspen, you can watch as locals and guests stroll by and stop in the Mill Street Fountain. Bites and buzz: Refuel with ceviche–or check out the entire oyster bar and coastal cuisine menu—and Ocho Ancho: a blend of tequila Ocho Blanco, prosecco, and ancho Reyes. For the casual diner, Shlomo’s wide sea of red umbrellas speckles the base of Aspen Mountain on the patio at Residences at The Little Nell. If you have a large crew or enjoy shared tables there are plenty of community dining options with this grand patio’s side-by-side picnic-table style seating. Bites and buzz: Grab breakfast and order the Shakshuka with fresh-squeezed OJ. The best patios in Aspen invite you outside this summer– to sip, sunbathe, and de-stress.